Use your favourite SSH client to connect to your remote server. If you are using a local machine, determine if IP address or domain name. Install Git. Create a folder to hold the repository. Initialize the repository using Git. Install Git. Create a folder to hold the local repository. 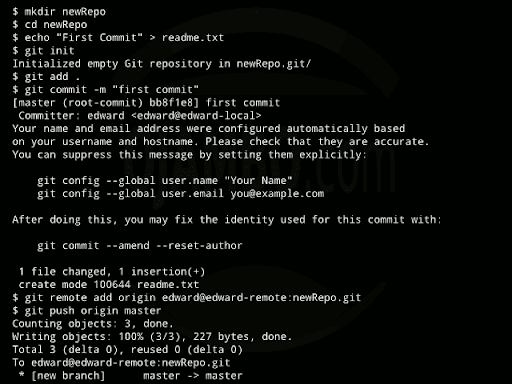 Initialize the repository using Git..
By default the remote server repository is called the master branch. The command “git remote add origin” must be ran at least once so that the remote information can be stored. The Readme.txt file can be created using any text editor. The “echo” command was used to speed up the process of created a simple text file using the command line. The “echo” command is cross-platform compatible. Let git know which files are to be pushed using the “git add” command. Add a message for the committed files using the “git commit -m” command. Push the changes using the “git push” command and specifying the location which is master in this tutorial. Git is a popular source code management system. Git is a distributed revision control system because every “working directory” contains the complete history and therefore revision tracking capabilities. A central server is not required for Git to work. Git can work on remote servers or local machines. Git can push changes committed changes when the network is available. Use descriptive names for the remote server repository folders. Use SSH protocol with Git. This entry was posted on Wednesday, February 13th, 2013 at 12:00 am	and is filed under Tips & Tricks. You can follow any responses to this entry through the RSS 2.0 feed. You can leave a response, or trackback from your own site.